Litter in paradise. 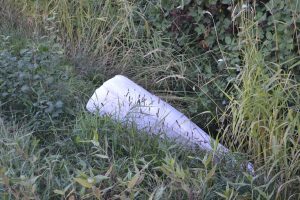 Who throws garbage on farmland? Steve Bridger doesn’t have enough fingers to count the number of times he’s had litter thrown on his award-winning garden in the last month. Yesterday, as he tells it, a gleaming BMW stopped at the side of the road, a passenger opened a door and tossed out fast food wrappers. “They didn’t see me pruning. When I hollered at them, they sped off in a spray of gravel, leaving me to clean up their mess,” he said. On a sunny Saturday afternoon, pedestrians, joggers, cyclists, and visitors in vehicles admire and photograph Bridger’s peaceful plot, set on farmland on the winding, rural, Finn Road. The garden surrounds his 1912 cottage, spilling across the road alongside Woodward’s Slough in an agricultural area of Richmond, a city 20 miles south of Vancouver. Adrienne Moore, a local painter, has set up her easel. “What is that divine fragrance?” she asks, walking past beds of asters, hollyhocks, lilies, gardenias, honeysuckle, roses, and sweet William. “Oh, it’s the lavender,” Moore decides. Bridger maneuvers his rake around clusters of violet lupines, unearthing soda cup lids and a child’s sock, mumbling about how he raked this last week, then using a gloved hand, wages war on cigarette butts permeating periwinkle ground cover. In the three decades he has tended his garden, he’s seen littering escalate. When he first bought the place and started creating the beds, he’d pick up beer bottles and cans on Sunday mornings. “That was about it,” he said. Over the years, candy bar wrappers and chip bags appeared. When a suburban mall was built a mile away, swathes of cardboard coffee cups and fast food containers materialized. As fees at the local landfill have risen, so has dumping. Bridger recently heard a car door slam on a quiet afternoon and looked out to see a woman hauling an old computer monitor and processor out of her trunk and dumping it in his flowerbed. He stormed outside and told the woman to take it away. “She had the gall to tell me it was a gift,” he said. “I had to threaten to phone the police before she would drag it back to her car. I know she offloaded it down the road,” said Bridger. Price says he’s seen drivers of expensive vehicles with children in baby seats throw garbage out of their windows. “I’ve seen couples stop, get out and casually unload garbage bags with styrofoam beside the road and then accelerate away,” said Price. The neighbors agree fines are the solution. “We need to take photos of license plates and email them to Richmond’s by-law enforcement department. 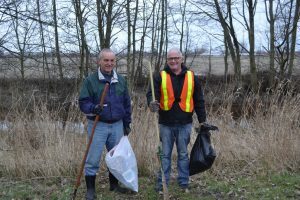 Then the City has to issue tickets so that litterers don’t come back here and ruin paradise,” said Bridger.